Since it's grape season, here's another quick grape snack. This is an all time favorite in our house. 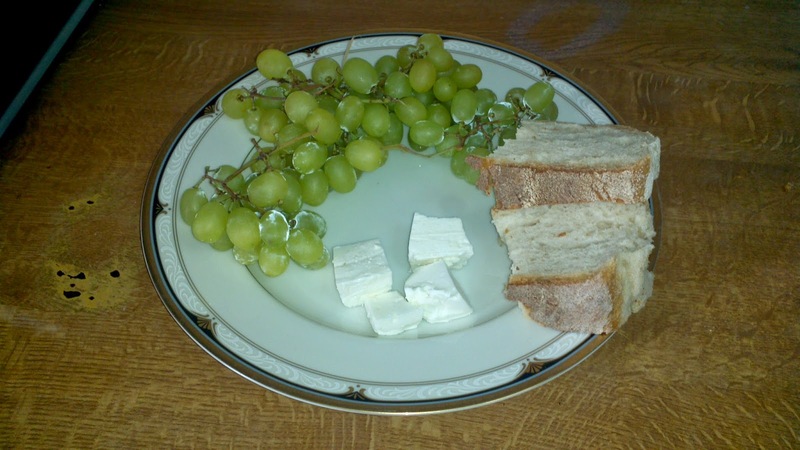 As I dig in the past, I have an incredible image of my childhood, My dad would drive half an hour away to get the best grapes and feta cheese ( Kefalonian Cheese ) we all loved it. So, today I went out got the best raisin grapes, fresh soft baked Greek bread and Kefalonin Cheese. By now you all should know this feta is my favorite. I had a fulfilling and health lunch today !!! Another tasty dish from my kitchen to yours : ) KALE OREXI !! I love grapes. I can't get enough of them lately. Thanks for sharing on #yuckstopshere link up. I share your love of Feta and grapes. I've never eaten them together before but I will now! Thanks for sharing with us at Home Matters. Please come again. Liebster award !! YEAH you have made my day !!! Thank you ladies for stopping by and when you do try this snack make sure you have Greek bread to try it with. I love grapes, and I never would have thought of adding feta. Great #snack. My husband loves Feta. I am going to see what he thinks about the combination. I never would have thought of it. Thanks so much!!! This looks so simple but tasty. I've not had feta for ages; might buy some and give this a go! Thanks for linking up with #WeekendBlogHop! Seems like a very light snack. Yummy! Thank You all besides it being yummy and light it's also healthy !! !